Literary Arts. "Blog Post: 2018 Literary Fellowship Recipient Matthew Minicucci." Oregon Literary Fellowships, 23 March 2018: click here for interview, notes from judges, and a new poem. Bocare, Patrick. "Talking Earth with Matthew Minicucci." KBOO, 19 February 2018: click here. Ripatrazone, Nick. "Must-Read Poetry: October 2017." The Millions, 3 October 2017: click here. For more media related to Small Gods, click here. Small Gods by Matthew Minicucci is one of the most beautiful, moving, and intelligent books of poetry I've read in I don't know how long. These poems and prose poems draw from sources as heterogeneous as the Pauline letters, the natural sciences, mathematics and astronomy in order to explore, inhabit, celebrate and mourn the mutability of love, the vulnerabilities of attachment and the unlikely, random and evanescent nature of existence itself. The depth and variety of metaphor mirrors the depth and variety of this poet's remarkable curiosity and openness to the world, in all its glory and horror. The poems stick to memory like burrs to a pant leg. Matthew Minicucci’s new book is a balm for our time. In a quiet voice, he counsels, “Wait, and watch…” Devoid of rhetoric, easy outrage, and exhortation, Minicucci advocates, instead, for the transformative power of close-up scrutiny – poetry’s timeless way of looking that encourages the nuanced narratives of “small gods” living in the margins and crevices of everyday life to rise into view. This is a book of rare intelligence, deep wisdom, and exquisite linguistic beauty. Small Gods enriches us with its moral courage and its compassionate faith in the ultimate value of our fraught humanity. 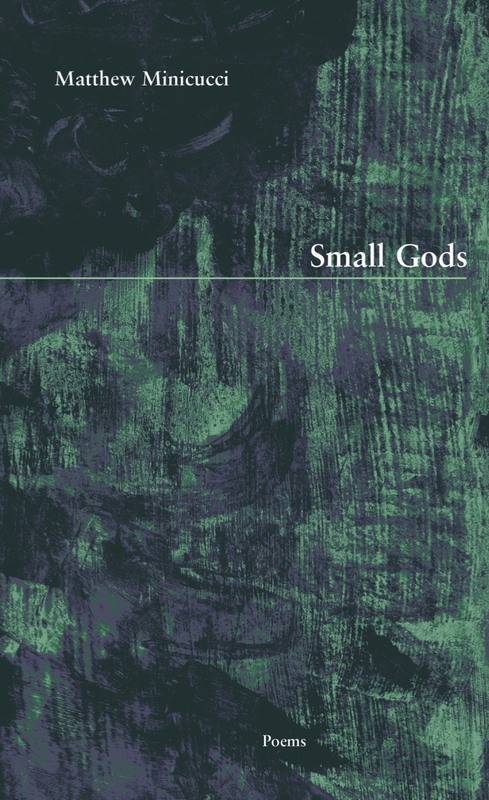 Small Gods reads like a sacred text with a tambourine keeping beat behind each verse. Matthew Minicucci manages to conjure not only the collective spirit but also the collective yearning that we may not give permission to express in our day-to-day lives. Whether rendering the quotidian or the biblical—and both appear, seamlessly—these poems ask all the right questions, which are really the answers to our concerns: "What if silence was the smallest unit of measure for distance between two people. An imaginary number." Or, what if, for instance, "The fear that light might only be within; or lost beneath a candle's douter," could be spoken? Minicucci allows the exploration—and the dread and the hope and the longing—to come to the surface of our lives and he invites us to join in. Amen! "What if, all this time, you were already home. What would you be willing to burn to light it?" Indeed the poems we encounter in Matthew Minicucci's Small Gods are a conflagration: visionary and other-worldly in their wisdom and scope. Small Gods is a big book—big on intellect, imagination, vulnerability, and unabashed beauty. Enter it knowing you will leave changed.